Completely far-fetched and unbelievable but at the same time an enjoyable tale of wild adventures dating back to Biblical times when men were giants and angels roamed the earth. A mystery as old as humankind. On January 25, 1829, the Portuguese brig Dourado sank off the coast of Indonesia, losing its cargo of priceless treasures from the Holy Land. One of these lost relics holds the key to an ancient mystery. But someone does not want this treasure to come to light. 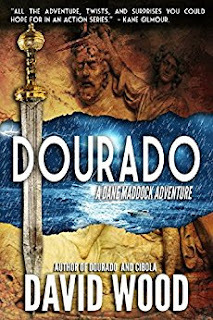 When her father is murdered while searching for the Dourado, Kaylin Maxwell hires treasure hunter and former Navy Seal Dane Maddock and his partner Uriah "Bones" Bonebrake, to locate the Dourado, and recover a lost Biblical artifact, the truth behind which could shake the foundations of the church, and call into question the fundamentally held truths of human existence. 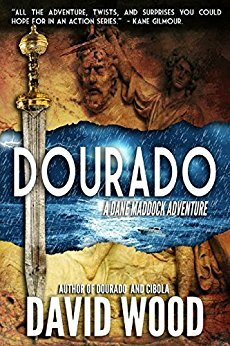 Join Dane and Bones on a perilous adventure that carries them from the depths of the Pacific to ancient cities of stone as they unravel the mystery of the Dourado.